An exemplar conservation roofing project at the historic Butchers’ Hall is currently nearing completion. The Hall, known to many in the town as the ‘Old Auction Rooms’, located next door to the Pannier Market, is a Grade II Listed building originally constructed in the 1860s for the Seventh Duke of Bedford as part of the planned redevelopment of Tavistock town centre. It is the first in a series of historically important buildings to undergo conservation work as part of the Tavistock Townscape Heritage Initiative (TTHI). This has been made possible by an award of nearly £1 million from the Heritage Lottery Fund and is the culmination of eight years hard work by a partnership of local Councils, businesses and community groups, co-ordinated by Tavistock Heritage with the Town Council as the accountable body. Original plans from the 1860’s clearly show the Butchers’ Hall in the area of ‘new markets’. Indeed, many of the butchers’ tables remain intact as well as almost all of the original features and architecture. The restoration works, which have taken almost 6 months to complete, have been expertly delivered by the Town Council’s appointed contractors, A D Williams Ltd of Saltash under the supervision of project architect Simon Crosbie (Le Page Architects), an historic building and conservation specialist whose track record includes restoration of Grade 1 buildings within the Royal William Yard. The most iconic element of the Hall is its distinctive dog-legged roof structure with two lanterns featuring clerestory windows and louvres running the length of the building. This has been completely overhauled including structural repairs to roof timbers, restoration of the clerestory windows and louvres, renewing the slates and reinstating rainwater gutters and pipes. One of the most difficult challenges was to remove all of the original (extremely thin) glass panes from the clerestory windows and to re-use them in the same frames following renovation. This work was executed with great care and skill by the contractors, who managed to salvage approximately 95% of the glass. The timber louvres, which were originally open for ventilation, have now been glazed discreetly on the inside to improve energy efficiency. A traditional lead gutter has been created to improve the capacity of the central valley to cope with the higher rainfall levels currently experienced, but the original half-round gutter can still be seen from inside the Hall. All of the external joinery has re-painted in Brunswick green, a modern colour that matches the original paint as established by site and laboratory analysis. Following removal of the scaffolding, there will still be some re-pointing to be completed using traditional methods and lime mortar as appropriate. The Tavistock Townscape Heritage Initiative (THI) is a £2-million regeneration programme involving repair and restoration of public and privately-owned buildings of historic merit, the enhancement of public realm areas, raising awareness of the town’s heritage and promotion of traditional conservation skills. The THI is supported financially by the Heritage Lottery Fund, Tavistock Town Council, West Devon Borough Council, Devon County Council, the Greater Dartmoor LEAF and private property owners. The next physical stage of the restoration project, to be undertaken under a separate contract, will involve internal adaptation and decorating works, including removal of timberwork partitions and design and installation of a new shop front/entrance at the Pannier Market end. It is envisaged that the building will be available for re-use by June 2017. In parallel with this the Council will be recruiting a marketing manager early in the New Year to explore options for bringing the Hall’s 400 square metres of space back into commercial use. It is envisaged that it will be used for purposes complementary to those of the Pannier Market, possibly for themed markets, which will provide Tavistock with an enhanced market ‘offer’ that will help to attract more people to the town centre. The Pannier Market is the next ‘Critical’ building to be addressed under the Townscape Heritage Initiative. Two successful skills workshops funded by the Townscape Heritage Initiative were held in the Butchers’ Hall on Tuesday 13 September 2016. 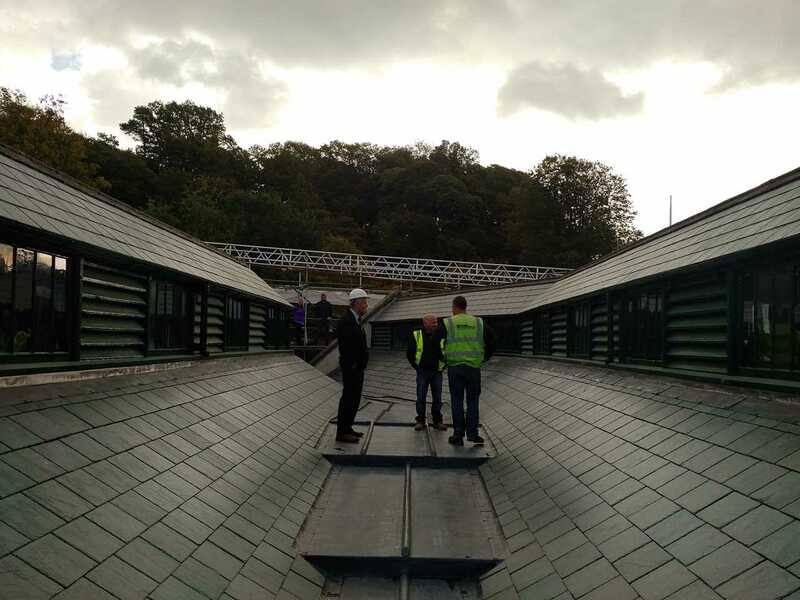 The morning session featured restoration of the roof, clerestory windows and ventilation louvres hosted by A D Williams Ltd, including commentary tours with Simon Crosbie, Project Architect. The afternoon session covered lime skills (including hot lime), delivered by the Cornish Lime Company. The workshops were attended by representatives from local construction companies and Tavistock Heritage, the Town Council and the Greater Dartmoor LEAF. It is the intention to hold a further Craft Skills Day open to the public at a date to be confirmed in 2017. Please go to Townscape Heritage Initiative for more information.